The Bry-Air Combo Honey Comb Resin Dryer packages a Honey Comb Resin Dryer (Dehumidified Dryer) along with a drying hopper and loader for primary & secondary as a compact unitary unit. The COMBO is tailor-made to suit the requirement of a plastics processors requiring just in time material for quick change over and assured reliable drying of hygroscopic resins. 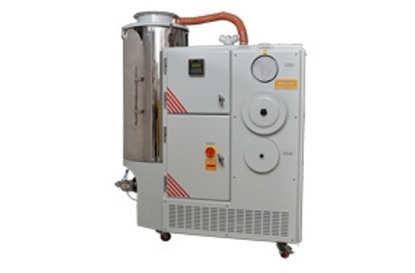 The multifunctional COMBO dehumidified dryer has been designed to meet the need of processors requiring quality drying of smaller quantities of hygroscopic plastics resins just in time. Mounted on castors, the COMBO dryer is portable and easy to handle and maintain. It assures proper drying of the toughest of hygroscopic resins. Powder coated and CNC fabricated, the COMBO series dehumidifier dryer is available in 30 CMH and 60 CMH variants.